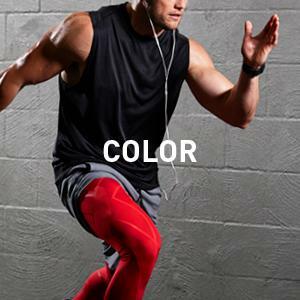 Available in a wide-range of colors to match your team uniform, the 2XU LKRM Compression Tight utilizes PWX Flex and PWX Weight fabrics to provide maximum power to support the key leg muscles - gluts, quads, hamstrings and calf. Graduated compression promotes circulation for improved oxygenation of muscles for both active and recovery uses. This lightweight tight is the ultimate compression tight for training, in-game competition and recovery. 1) Supports and protects gluts, abductors, IT band, quad, hamstring and calf muscles. 2) Muscle Containment for reduced vibrations & oscillation, less fatigue & muscle damage. 3) Increased circulation for improved muscle performance & faster recovery. 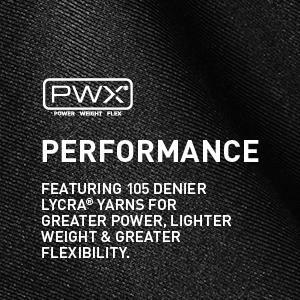 4) PWX FLEX and PWX WEIGHT compression fabrics provide a 70/105 Denier strength to the front and back panels. 1) New comfort waistband for a relaxed yet secure fit. 2) Flatlock seams to reduce chafe with SPF 50 Sun protection. 3) High filament yarns for dryness – wicks moisture from the skin to the fabric exterior. 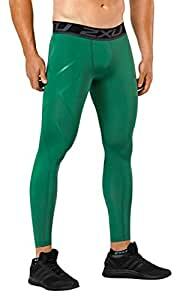 Available in a wide-range of colors to match your team uniform, the 2XU lkrm compression tight utilizes PWX flex and PWX weight fabrics to provide maximum power to support the key leg muscles - gluts, quads, hamstrings and calf. Graduated compression promotes circulation for improved oxygenation of muscles for both active and recovery uses. This lightweight tight is the ultimate compression tight for training, in-game competition and recovery. First off - I'm a huge fan of 2XU gear - I've tried compression tights from other athletic brands such as Under Armour and Nike and they do not even compare to the quality of these tights. Yes - 2XU products are typically more expensive than those brands, but you definitely get what you pay for. 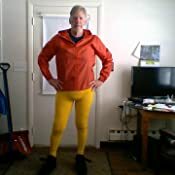 I use my tights for a wide range of activities - from running, to cycling to cross-training, both during and post exercise. 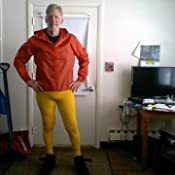 I'm getting on in years now, so i definitely feel the benefits of wearing the tights, post-activity to help speed up my recovery. I bought my size based off there size chart, and they fitted exactly as expected. 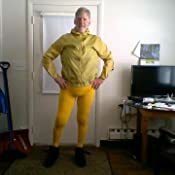 Once on, I could, immediately tell the difference from cheaper brands I've worn before - from the quality and "feel" of the material, to the Compression on my legs. I own other pairs of 2XU tights, and I will continue to be a brand advocate going forward after purchasing this pair. 5 stars ! I'm quite fond of these tights. I'm a big fan of 2xu and gave these a try at a lower price to see what I thought of the banded waist. I liked it, but it's a little wide and I guess so am I, so it does roll if you're not wearing anything over it (like shorts). Otherwise these were great. The fabric has a higher elastane content than most other 2xu tights and resulted in a better compression with a thinner feeling fabric. Buyer beware on the thinner fabric though. It means they leave less to the imagination. Im pretty sure these are meant to be a baselayer anyway, so it shouldn't matter, but I typically never wear shorts over mine. I purchased several colors I like them so much. 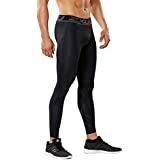 5.0 out of 5 stars2XU Men's Tights are Among the Best Men's Compression Tights. These men's tights are great, like all 2XU men's tights. 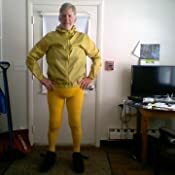 I find they, like all men's tights work best with a dance belt for support and comfort while active. These men's tights feature a key pocket. They have no drawstring like other 2XU models, but they stay up on the waist anyway, even playing basketball. They are great for the gym, running, basketball, etc. They have front seams but they are not too much in the way. Great men's tights. Buy em. 5.0 out of 5 starsTight enough to be effective, and white enough to pass tennis dress code! I have compromised circulation in my legs and play tennis at a club that requires white apparel. Tights that are tight enough help keep blood from pooling in my legs. Tights that are not tight enough do nothing. These are the only white tights I’ve tried, and I’ve tried them all, that are tight enough to be effective. I now own four pairs. 4.0 out of 5 starsNot for tall folks. In all fairness, these are high quality compression tights, and if they fit you, you'll be happy as a bug in a rug. However, I had to send mine back. I'm 6'6" tall and the XXL came down to just below my knees. These aren't 3/4 length leggings, they are just meant for folks with a much shorter inseam than what I have. I'd bet if you were about 5'10" you'd be happy with the length on these. My husband bought these originally to be "tights" for a Peter Pan costume. Ok so I bought them and made him wear them. But now, he loves how easy it is to move int hem and has changed his sweatpants to these for his nightly run. 5.0 out of 5 starsThey really do work, holly poo! 2XU makes nice higher end products. Have many different compression shorts and full length. Work awesome, I am on my feet all day in a bike shop. My legs DO feel better at the end of day. Tight, durable, and a perfect antidote to chafing—I'm a fan. Plus, I get the gold ones, and they make me feel like a superhero... and that's worth at least a bonus star.